Our company specializes in the production and sale of mine loading and unloading equipment, this product is four unlike the car, four unlike the mine truck, mine truck, tunnel slag truck, the car can be used in non-coal mine tunnel slag transport, and with mine safety signs. At present and in the future, mine development is a trend, but also a national requirement for mining enterprises - the use of machinery or equipment in mine tunnels in strict accordance with the mining safety regulations to implement. The four unlike cars produced and sold by our company are strictly in accordance with the national standards: GB21500-2008 "Safety Requirements for Underground Mine Trackless Tire Cars" and Q/SZSW01-2015 "Underground Dump Trucks". So please buy four unlike mine trucks must pay attention to whether it meets the relevant national standards, to avoid being deceived. 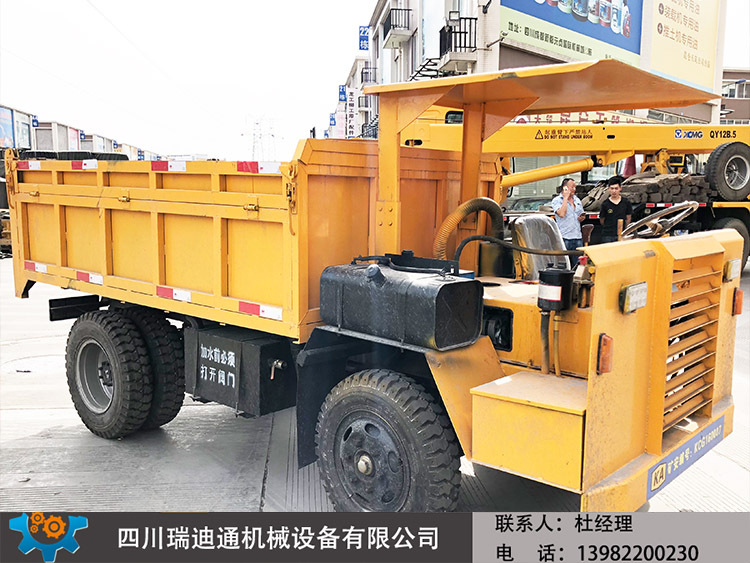 The four unlike the main configuration of the car is: the engine matched with a FAW Xichai 490 diesel engine, power 64 horsepower, Liansheng 145 with sub-gearbox, the actual load is 7-8 tons, the front axle matched with Fujian Wanteng 1045 air brake front axle, the rear axle matched with Fujian Wanteng 1069 casting air-break brake rear axle, braking effect is good, the girder is eight thick rectangular tubes. Beam, the bottom of the carriage is 6 thick, and the side plate is 4 thick. It is very suitable for slag disposal in mine tunnels. The front wheel matches the 6.50-16 mining tire, and the rear wheel matches the twin 7.00-16 mining tire. Double hydraulic dump bucket self unloading, with high and low speed. The size of the carriage is 2.8 meters in length, 1.6 meters in width and 0.7 meters in height of the railing. The average height of the train is only 1.7 meters except for the simple shed above. It is very low and suitable for the mine with low tunnel height. Four unlike cars, four unlike tramcars, four unlike slag trucks can be used not only in mine tunnels, but also in construction sites or road construction pull concrete use, instead of diesel tricycles, a four unlike car is equivalent to three diesel tricycles, and also save two drivers. And the amount of maintenance is much lower than that of diesel tricycle!